Delhi is an ideal blend of the old and new, custom and modernity. The capital of India, New Delhi is a dazzling city that is also the political hub of India. 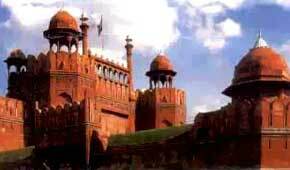 A large number of historic monuments and heritage sites of India located in New Delhi. The written records of the existence of Delhi go back to 11th century when it was known as Dillika. This kingdom was known as Lal Kot. The famous Tomar ruler, Prithvi Raj Chauhan built many temples and a huge fort called Qila Rai Pithora in Delhi. However, their two centuries old rule culminated with the arrival of the first set of invaders-the Slave Dynasty. One of the rulers of this dynasty, Qutub-ud-din Aibak, built the tall Qutab Minar. By the end of the 13th century, the Khilji Dynasty laid the foundation of Siri Fort. Ghiyasuddin Tughlaq succeeded Alauddin Khilji and, as vanity demanded, built a magnificent fort at Tughlaqabad. In those days of treason, Ghiyasuddin fell prey to his son Mohammad Bin Tughlaq's ambition. Mohammad built his own city, Adilabad, a few yards away from Tughlaqabad. His nephew Ferozshah Tughlaq built the fort Ferozshah Kotla. The famous battle of Panipat brought the fulcrum back to Delhi from Agra making Sher Shah Suri, the ruler. Sher Shah laid the foundation for the Grand Trunk Road and built the Old Fort. living legacy of Delhi is Shahjahanabad created by Shahjahan. This city, with the Red Fort as the focal point and Jama Masjid as the praying center, has a fascinating market planned to shine under the light of the moon, called Chandni Chowk. Chandni Chowk remains Asia's largest wholesale market. Modern Delhi, or New Delhi as it is called, centers around Rashtrapati Bhawan. It is architecturally a very impressive building standing at a height, flowing down as it were to India Gate. Delhi remains the center of power, bureaucratic power and corporate power too. The most fascinating aspect of this city is its cosmopolitan nature. You can find the whole of India in its little colonies and structures. The India Gate is a favorite tourist spot, a memorial in tribute to the soldiers martyred in the Afghan War. Names of all these heroic men are inscribed on it. Humayun's Tomb and the Qutub Minar are the next most visited historic tourist places. They truly reflect Mughal architecture revealing the grandeur of the Mughal era. The Qutub Minar is the tallest monument in India. The Red Fort with the Rang Mahal, Mumtaz Mahal and Peacock Throne, is the venue of the Independence Day parade of India every year, standing with the old-world Mughal ambience enduring all its traditions and customs. Chandni Chowk is Asia's largest wholesale market. The delicious Parantha Wali Gali, Darya Ganj and Dariba Kalan- the oldest jewellery market dating back to the Mughal period are all located here. The Raj Ghat, Shanti Van, Laxminarayan Temple, Rashtrapati Bhawan, Purana Quila, Baha'i Temple (Lotus Temple) and Tughlaqabad Fort are the other tourist places in Delhi. Delhi lies quite close to many other tourist spots. The proximity of Delhi to these places makes it a tourist hub for all the travellers coming from India and abroad. The most popular ones being the Neemrana Fort, built by Prithviraj Chauhan III in 1464; the city of Taj Mahal Agra, the play ground of Lord Krishna Mathura and Vrindavan near Agra, Sultanpur Bird Sanctuary, Fatehpur Sikri Tilyar Lake, Surajkund, Mud Fort, Kesroli and Badhkal Lake. 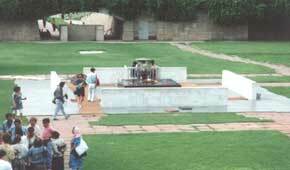 These excursion tours from Delhi complete your Delhi tour in real sense. The capital of India, Delhi, is conveniently connected to all the major cities of the India and the world with almost all the major airlines. Delhi has an international as well as a domestic airport. Super-fast and express trains connect Delhi to almost all the major cities in the country. The city has three major railway stations at New Delhi, Old Delhi, and Nizamuddin. New Delhi is also known for its excellent road network, which connects the city to all the major cities of northern India, by road.